The Italian fashion company, leaded by Giorgio Armani, was designing a new collection focused on a denim style in the Early 80’s: Armani Jeans. The elegance line that the Italian brand has followed since its beginnings is become fused, this time, with a casual and classic style of Armani Jeans. 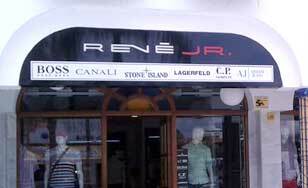 is an Italian fashion label that designs total look collections for men and women, denim and a variety of accessories. Style, taste and heart of a genuine fashion brand, created in Franciacorta and dedicated to living life. Naturally casual chic, those who wear AT.P.CO are first and foremost themselves - at ease anytime, anywhere. AT.P.CO reveals itself more and more as a complete way of being: a universe of style and value marked by consistent references, collection after collection. Natural-care style enriched with touches of originality defines the fundamental DNA of lines for him and her: a couple attentive to changes, contemporary and dynamic. The energetic BOSS collection combines perfectly the masculine style with the most sportive and informal clothing lines. In the Boss line by Hugo Boss, you will find a more varied collection of casual clothes for men, Chinese with bright colors and classic polos, slippers and parkas with a sporty design and all with the quality, innovation and design of the Hugo Jefe brand. Buy the best items from Hugo Boss in our exclusive fashion store for men in Tenerife, René Jr.
CP Company is a weaving workshop focused on production and design of sports clothing. With more than 25 years in the professional sector, CP Company brings about all its making process very precise due to the innovation in every design. The most important creation of this firm was the famous Millemilla Goggle Jacket in the late 90’s. Napapijri's collection blends the brand’s heritage and its future positive attitude by playfully exploring the possibilities of present trends. From superlight jackets to supersoft tracksuits, from elegant knitwear to sporty fleeces, all the way to scarves and hats, this collection is energised by warm colours, styled in premium fabrics, and completely fur- and down- free. A feast for the eyes, the senses, and the soul.